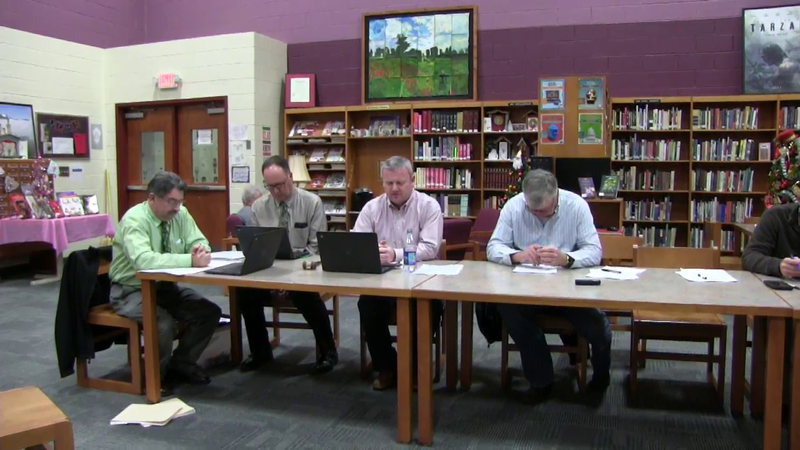 The Union County Board of Education met in regular session on Thursday, December 13, in the library of Union County High School. Marty Gibbs from district one conducted the meeting. Others present were Danny Wayne Collins (district five), Andrew Reed (district six), and Casey Moore (district three). The board approved the agenda and the consent agenda. Ann Dyer, Finance Director, presented the budget's amendments and transfers as well as the Tennessee School Board Association Contract. The TSBA Contract for $3500 annually and the budget amendments, transfers, and contracts were approved on roll call votes. In the workshop, Dr. Jimmy Carter, Director of Schools, explained that tenure no longer could be voted on in the spring since recommendations for tenure must include 5 years experience with a level 3 or greater to reflect teacher effectiveness and the teacher effectiveness results do not arrive from the State until November. The Board approved the teachers recommended for tenure. The TNVA Parent Handbook, Crisis Manual, and Special Education Internal Procedures have been revised by the principal and staff. The Board approved the revisions. The UCPS Policy and Procedures Manual change to Vacations and Holidays that would make Christmas Eve a federal holiday for federal employees was approved on first reading. The Board is reviewing other policy changes that include attendance and mandatory water testing. These revisions will be discussed in January. The Board is returning to its former meeting date of the second Thursday of the month to better facilitate reports to County Commission and have all financial matters approved in the same month. The next meeting will be on Thursday, January 10, at UCHS at 6:00 PM.